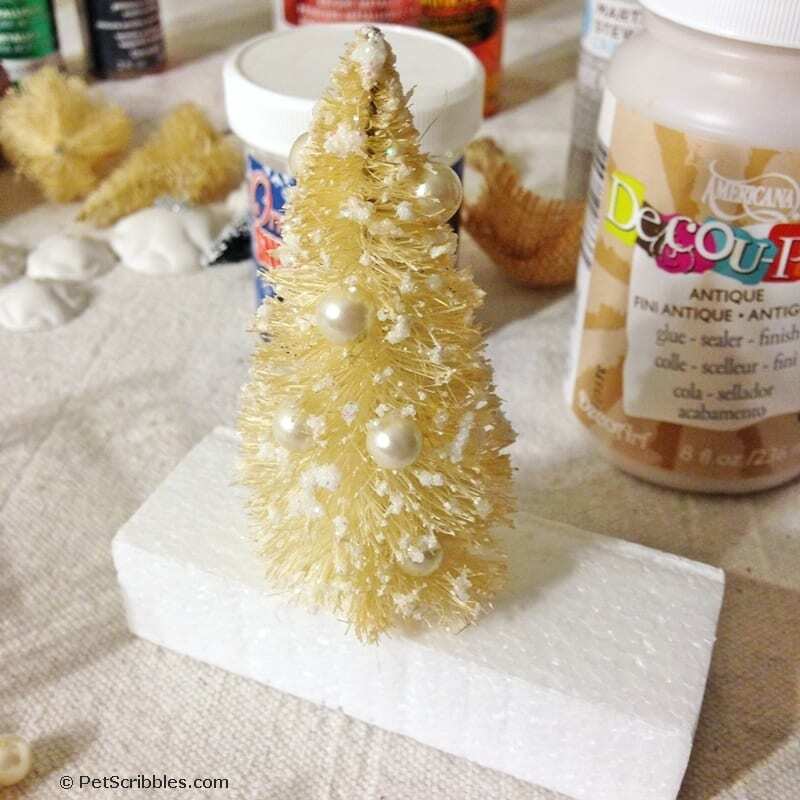 Today I’m showing you how to make a beautiful bottle brush tree ornament! 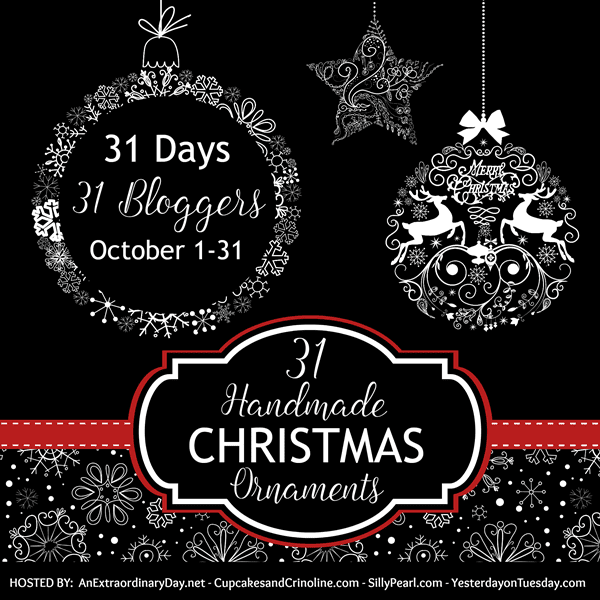 Yes it’s only October 6th, but today it’s my turn as part of the 31 Days of Handmade Christmas Ornaments BlogHop: an entire month featuring a new handmade DIY for you! 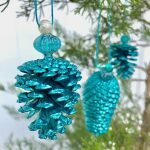 This is my second year participating in the Handmade Christmas Ornaments Blog Hop! Last year, I made these pretty red and green ornaments. 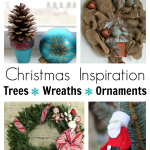 Click on that link to see my ornaments plus links with pictures to each of last year’s Blog Hop tutorials. 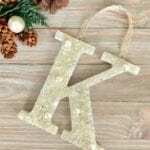 At the bottom of this post will be the full list of all DIY bloggers participating in this year’s Blog Hop, along with pictures and links to their own handmade ornaments! 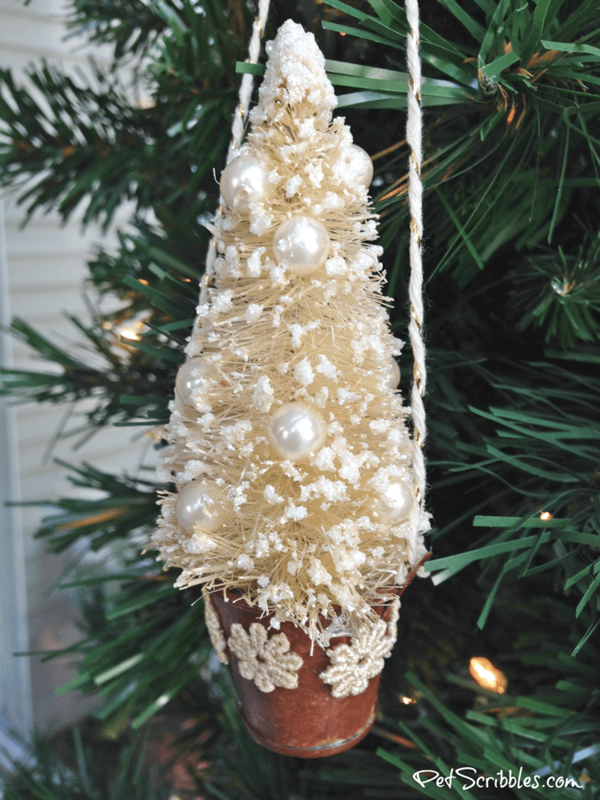 Imagine an off-white, miniature bottle brush tree, snow-covered, in a rusty bucket with pearl ornaments. 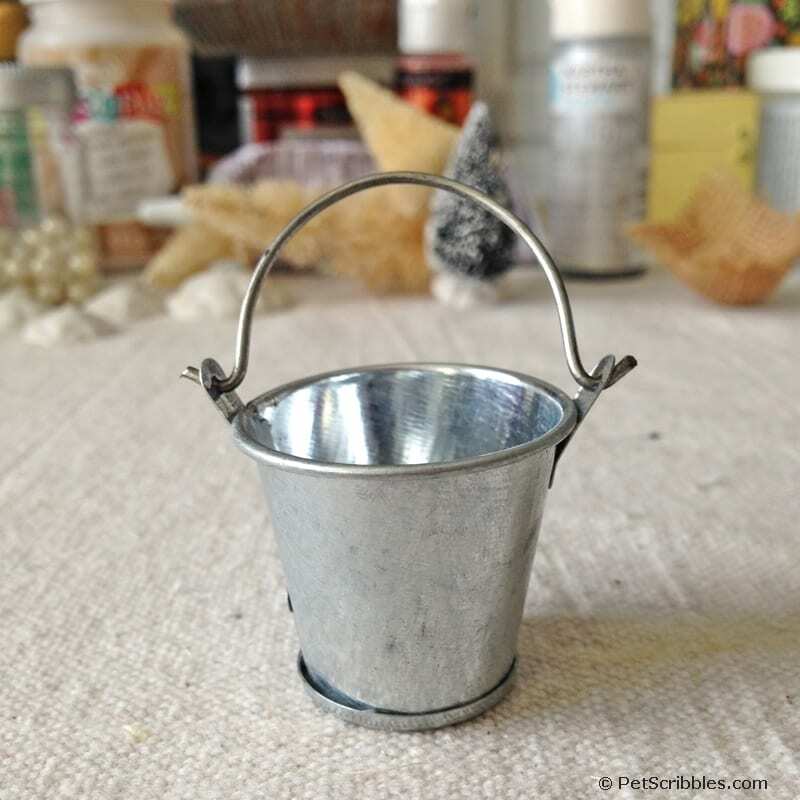 It all begins with a miniature bucket, which you can find in the fairy garden or miniatures aisle at your craft store. 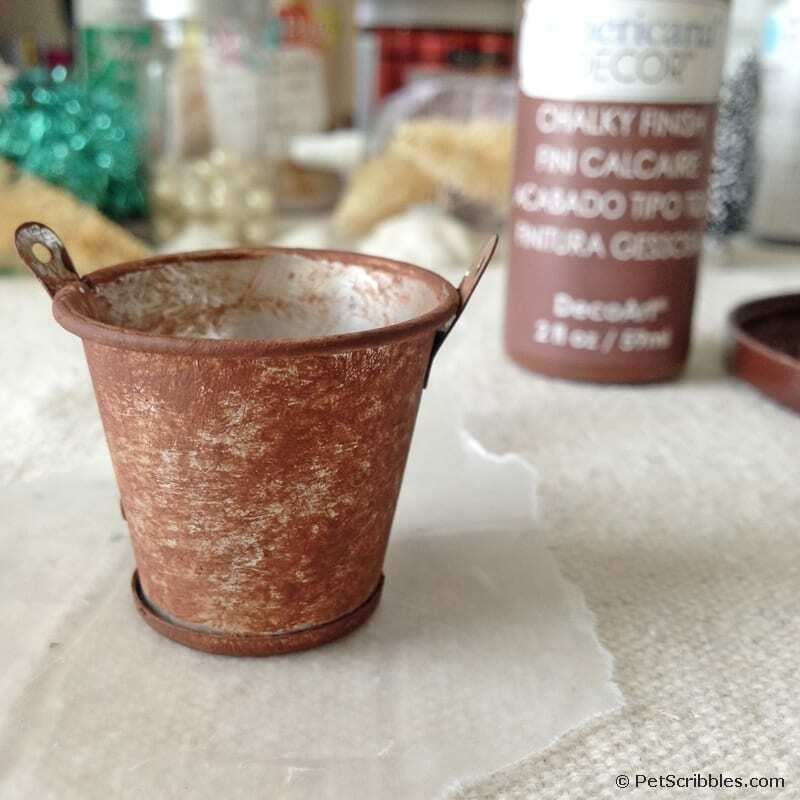 Step One: Use brown chalk paint to make the bucket rusty. Dab on the chalk paint with a small paintbrush, both inside and outside of the bucket. Do as little or as much as you prefer, depending on the look you want. Let dry. Step Two: Seal the bucket with a coat of Decou-Page, both inside and out. Let dry on wax paper. 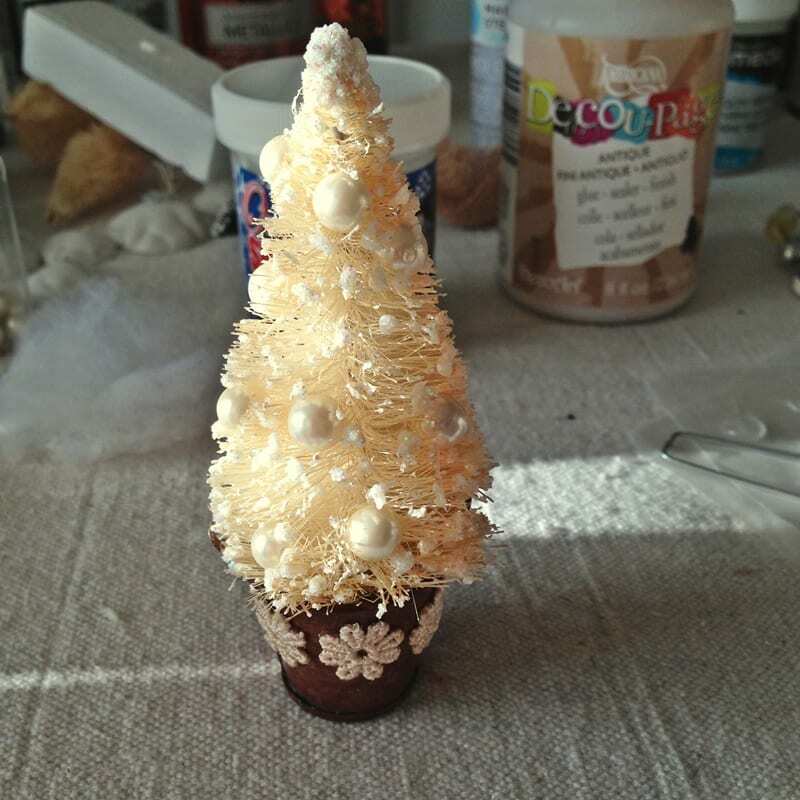 Step Three: Using a small paintbrush, scoop out some of the DecoArt Glittering Snow and tap and push it into the tiny branches of the bottle brush tree. Start with a tiny amount of snow and gradually build up until you like the look of the tree. 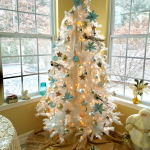 You can create a snow-covered tree, a snow-dusted tree, or somewhere in the middle. Remove any base from your bottle brush tree — usually you can easily twist to unscrew — and stick the tree into a scrap piece of Styrofoam. This makes painting, embellishing and drying much easier. The directions say it takes 24 hours for complete drying time, so plan for this. 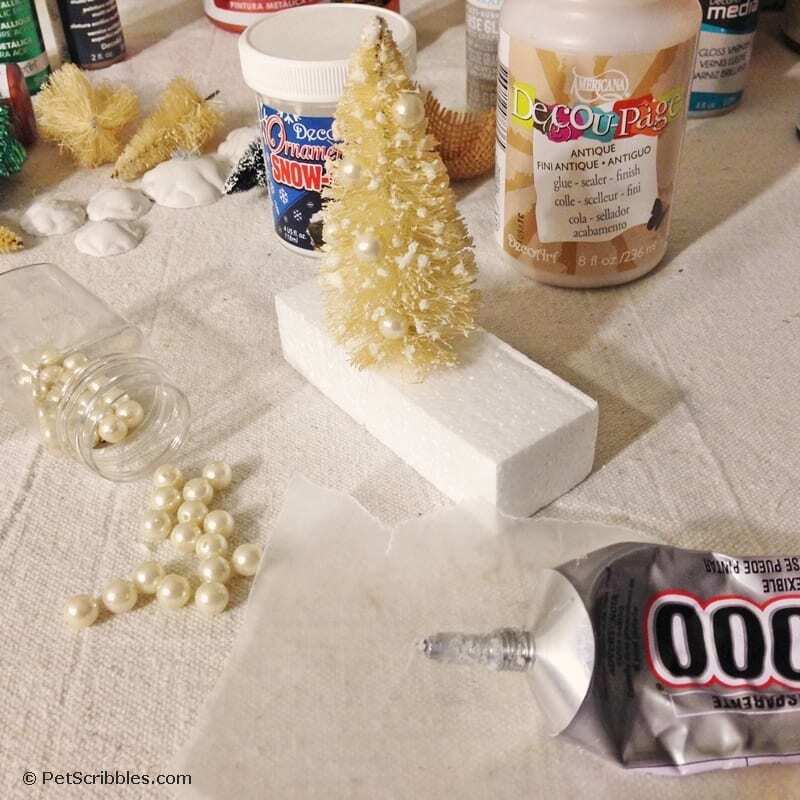 Step Four: Using E6000, attach individual pearls to the bottle brush tree. Let dry thoroughly. 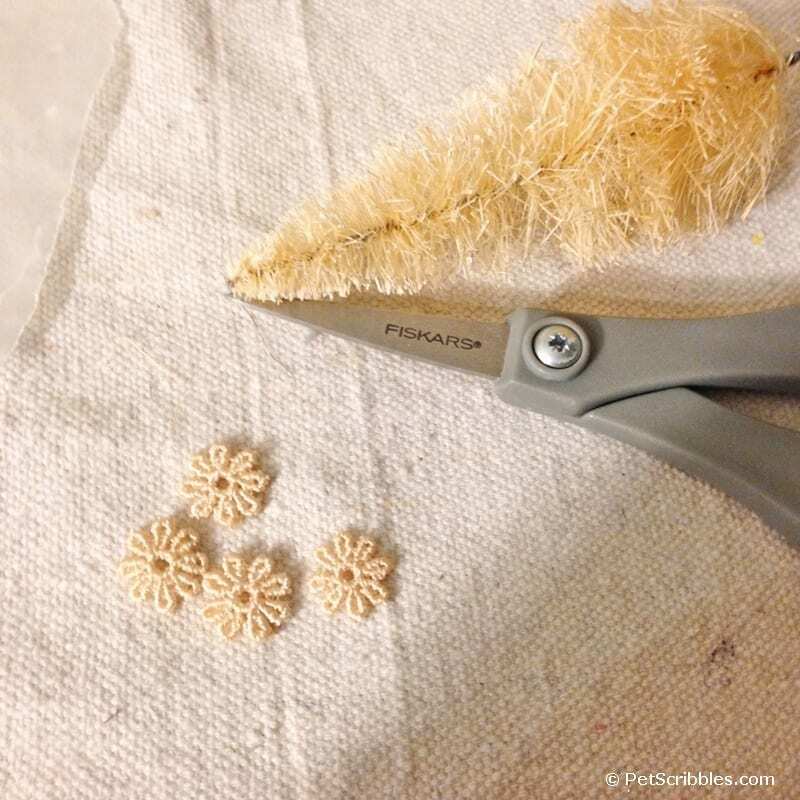 Step Five: Cut up a tea-stained small floral lace scrap, and adhere the individual flowers to the rusty bucket with Glue Dots. Step Six: Tie decorative baker’s twine to each handle to hang. Make sure to allow enough room for the bottle brush tree. Step Seven: Stick a small cotton ball into the rusty bucket. Add some E6000 to the inside bottom of the bucket, then the cotton ball. Step Eight: Squirt some E6000 onto the bottle brush tree stem and stick it into the bucket. Hold in place for about 30 seconds then let dry thoroughly. 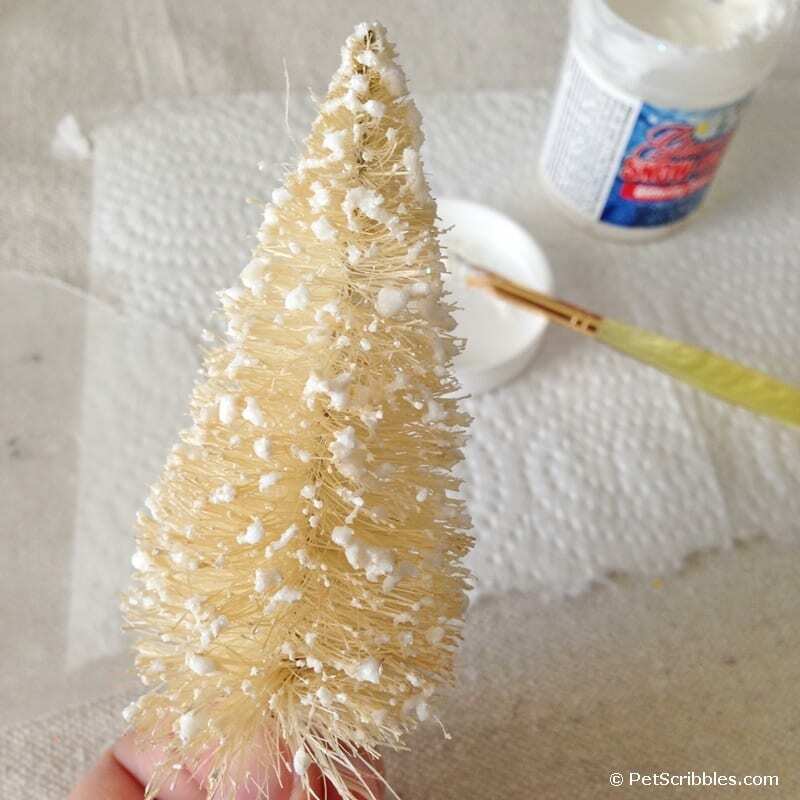 And now you have a beautiful bottle brush tree ornament! 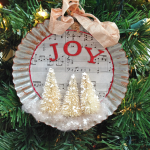 Now is the perfect time to begin making handmade Christmas ornaments! And these days, especially with all that’s available at the craft stores, it’s easier than ever to create something pretty. Please visit my bloggy friends below to see the ornaments each of them made. And stop back here to revisit this section, because we’re just getting started on our month-long ornament extravaganza! Absolute;y adorable, Laura! You found a new cute way to use bottle brush trees! Thanks Malia! I have a bunch of tiny trees that I bleached a couple of years back but never used yet. So…more fun to come soon! So pretty, I especially love the pearls. Thanks Julie! So glad I had a broken necklace to use, as they were the perfect size! Oh that’s so sweet Laura!! Pinned to my Handmade Christmas board. Why thank you Kerryanne! I appreciate it! What a pretty ornament! I love anything vintage, so this ornament is especially appealing to me. That makes me feel really good Paula, as I really wanted this to look vintage! Thank you! Thanks so much Diane! And thank YOU for keeping all of us completely organized. It’s a large group and you are a rock star! This is so cute, Laura! I’m a sucker for bottle brush anything and I see this little craft project in my future!! Thanks Jennifer! I’m a sucker for anything bottle brush too! I love bottle brush ornaments, Laura! 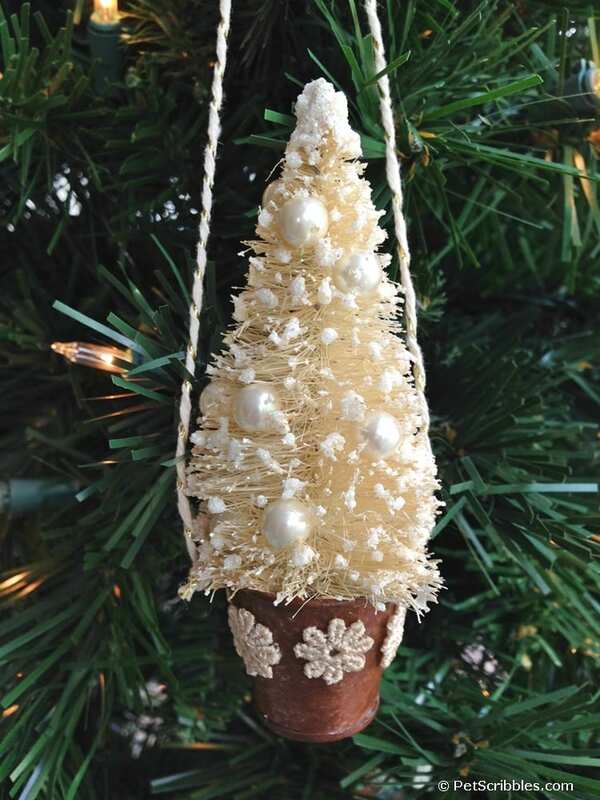 this is such a unique way to display a bottle brush tree – so cute!!!! 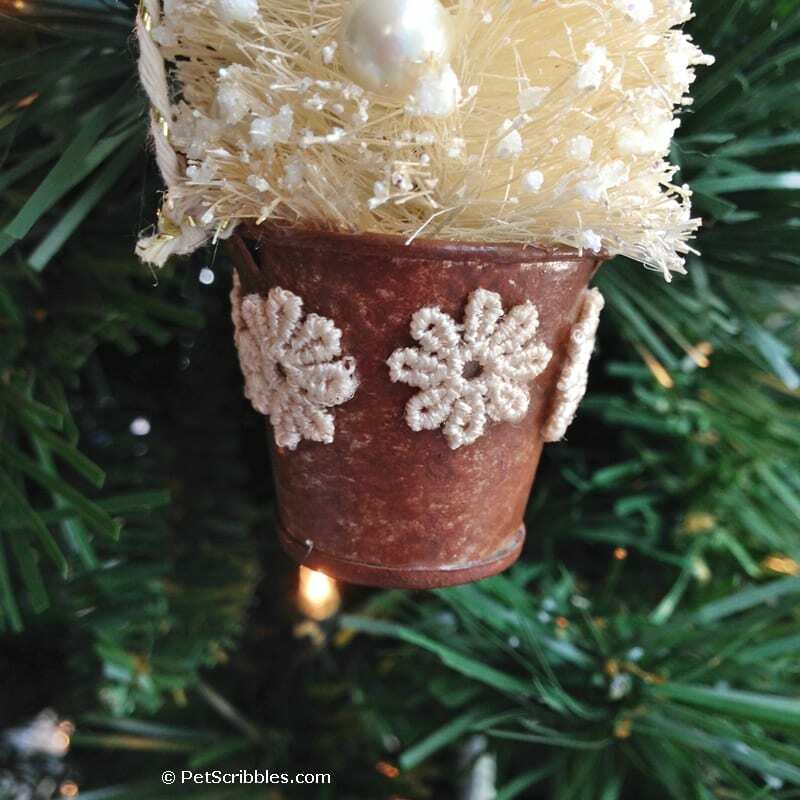 Thanks Mary Beth, from one bottle brush ornament lover to another! This is so adorable, and I love how you made the bucket look rusty. Pinned it! Thanks so much Angie! I really appreciate it! Awwww I adore these. I sooo want to make some of these this year. Thanks for the tute and also showing how to add the “snow.” Rocked it! Thanks Barbara! You’ve made my morning! Will give the trees a try. My wife loves any Christmas decorations that are white, so the kids and I will give it a go. Glad to hear it Marcus! I think your kids will enjoy making these, just make sure you supervise with the E6000 glue so no little fingers get stuck together! I love how you always turn the ordinary into the extraordinary. This ornament is awesome! Wow!! I love the transformation of that galvanized bucket!! Amazing!! This is super cute, would make great gifts too! Ahhh!!! The CUTENESS! This is so fantastic. Absolutely love it!! What a pretty little tree! I’m in love!